20) “For the kingdom of heaven is like a landowner who went out early in the morning to hire laborers for his vineyard. 2After agreeing with the laborers for the usual daily wage, he sent them into his vineyard. 3“When he went out about nine o”clock, he saw others standing idle in the marketplace; 4and he said to them, ‘You also go into the vineyard, and I will pay you whatever is right.’ So they went. A Jewish mother put her two young sons in a double stroller and went to the park. There an older woman approached her and admired the two boys. “How old are they?” she asked. 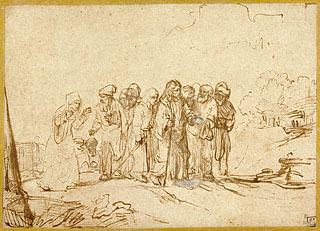 29As they were leaving Jericho, a large crowd followed him. 30There were two blind men sitting by the roadside. When they heard that Jesus was passing by, they shouted, “Lord, have mercy on us, Son of David!” 31The crowd sternly ordered them to be quiet; but they shouted even more loudly, “Have mercy on us, Lord, Son of David!” 32Jesus stood still and called them, saying, “What do you want me to do for you?” 33They said to him, “Lord, let our eyes be opened.” 34Moved with compassion, Jesus touched their eyes. Immediately they regained their sight and followed him. "With God All Things Are Possible" by American artist Mark Lawrence, 2008. 19) When Jesus had finished saying these things, he left Galilee and went to the region of Judea beyond the Jordan. 2Large crowds followed him, and he cured them there. 13Then little children were being brought to him in order that he might lay his hands on them and pray. The disciples spoke sternly to those who brought them; 14but Jesus said, “Let the little children come to me, and do not stop them; for it is to such as these that the kingdom of heaven belongs.” 15And he laid his hands on them and went on his way. 22When the young man heard this word, he went away grieving, for he had many possessions. 18) At that time the disciples came to Jesus and asked, “Who is the greatest in the kingdom of heaven?” 2He called a child, whom he put among them, 3and said, “Truly I tell you, unless you change and become like children, you will never enter the kingdom of heaven. 4Whoever becomes humble like this child is the greatest in the kingdom of heaven. 5Whoever welcomes one such child in my name welcomes me. Jesus said, "Whoever welcomes a little child like this in my name welcomes me." 6“If any of you put a stumbling block before one of these little ones who believe in me, it would be better for you if a great millstone were fastened around your neck and you were drowned in the depth of the sea. 7Woe to the world because of stumbling blocks! Occasions for stumbling are bound to come, but woe to the one by whom the stumbling block comes! 8“If your hand or your foot causes you to stumble, cut it off and throw it away; it is better for you to enter life maimed or lame than to have two hands or two feet and to be thrown into the eternal fire. 9And if your eye causes you to stumble, tear it out and throw it away; it is better for you to enter life with one eye than to have two eyes and to be thrown into the hell of fire. 10“Take care that you do not despise one of these little ones; for, I tell you, in heaven their angels continually see the face of my Father in heaven. 12What do you think? If a shepherd has a hundred sheep, and one of them has gone astray, does he not leave the ninety-nine on the mountains and go in search of the one that went astray? 13And if he finds it, truly I tell you, he rejoices over it more than over the ninety-nine that never went astray. 14So it is not the will of your Father in heaven that one of these little ones should be lost. 15“If another member of the church sins against you, go and point out the fault when the two of you are alone. If the member listens to you, you have regained that one. 16But if you are not listened to, take one or two others along with you, so that every word may be confirmed by the evidence of two or three witnesses. “Forgive Me’ sung by Rebecca St. James. The video tells its own story. 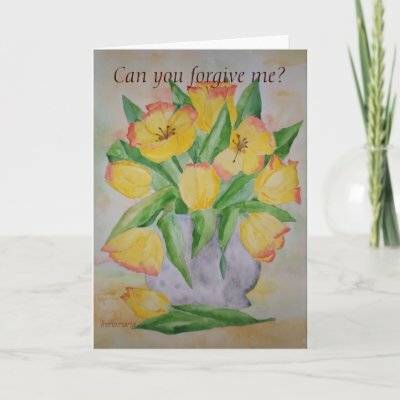 Is there someone, alive or dead, against whom you are holding a grudge — someone you should forgive? 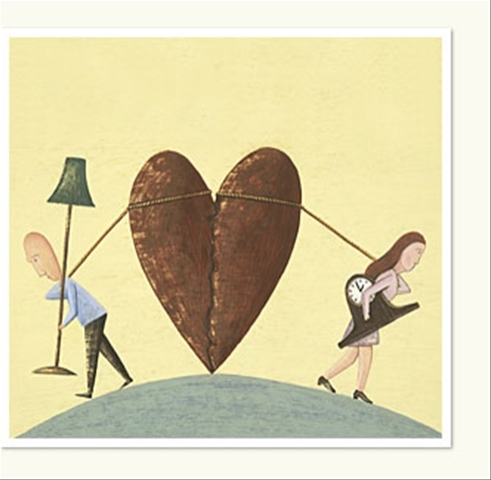 Can you choose to forgive him or her from your heart, right now? 23“For this reason the kingdom of heaven may be compared to a king who wished to settle accounts with his slaves. 24When he began the reckoning, one who owed him ten thousand talents was brought to him; 25and, as he could not pay, his lord ordered him to be sold, together with his wife and children and all his possessions, and payment to be made. 26So the slave fell on his knees before him, saying, ‘Have patience with me, and I will pay you everything.’ 27And out of pity for him, the lord of that slave released him and forgave him the debt. 30But he refused; then he went and threw him into prison until he would pay the debt. 31When his fellow slaves saw what had happened, they were greatly distressed, and they went and reported to their lord all that had taken place. 32Then his lord summoned him and said to him, ‘You wicked slave! I forgave you all that debt because you pleaded with me. 33Should you not have had mercy on your fellow slave, as I had mercy on you?’ 34And in anger his lord handed him over to be tortured until he would pay his entire debt. "Transfiguration of Christ" by Raphael, 1519 (The Vatican). Two stories are painted: the Transfiguration, above, and the healing of the demon-possessed boy, below. 17) Six days later, Jesus took with him Peter and James and his brother John and led them up a high mountain, by themselves. 2And he was transfigured before them, and his face shone like the sun, and his clothes became dazzling white. 3Suddenly there appeared to them Moses and Elijah, talking with him. Moses and Elijah were the two greatest prophets in the Old Testament. Moses represents the law, or the old covenant. He wrote the Pentateuch, and he predicted the coming of a great prophet (Deuteronomy 18:15-19 — The LORD your God will raise up for you a prophet like me from among your own brothers. You must listen to him. For this is what you asked of the LORD your God at Horeb on the day of the assembly when you said, “Let us not hear the voice of the LORD our God nor see this great fire anymore, or we will die.” The LORD said to me: “What they say is good. I will raise up for them a prophet like you from among their brothers; I will put my words in his mouth, and he will tell them everything I command him. If anyone does not listen to my words that the prophet speaks in my name, I myself will call him to account.”). Elijah represents the prophets who foretold the coming of the Messiah (Malachi 4:5-6 — “See, I will send you the prophet Elijah before that great and dreadful day of the LORD comes. He will turn the hearts of the fathers to their children, and the hearts of the children to their fathers; or else I will come and strike the land with a curse.”). Moses’ and Elijah’s presence with Jesus confirmed Jesus’ Messianic mission — to fulfill God’s law and the words of God’s prophets. 6When the disciples heard this, they fell to the ground and were overcome by fear. 7But Jesus came and touched them, saying, “Get up and do not be afraid.” 8And when they looked up, they saw no one except Jesus himself alone. “Beautiful Savior” sung by Deborah Liv Johnson. 11He replied, “Elijah is indeed coming and will restore all things; 12but I tell you that Elijah has already come, and they did not recognize him, but they did to him whatever they pleased. So also the Son of Man is about to suffer at their hands.” 13Then the disciples understood that he was speaking to them about John the Baptist. 17Jesus answered, “You faithless and perverse generation, how much longer must I be with you? How much longer must I put up with you? Bring him here to me.” 18And Jesus rebuked the demon, and it came out of him, and the boy was cured instantly. 22As they were gathering in Galilee, Jesus said to them, “The Son of Man is going to be betrayed into human hands, 23and they will kill him, and on the third day he will be raised.” And they were greatly distressed. Lunch of St. Peter's fish at the Ein Gev kibbutz restaurant, Israel. The fish I ate was delicious -- but no coin in its mouth for me! 16) The Pharisees and Sadducees came, and to test Jesus they asked him to show them a sign from heaven. 2He answered them, “When it is evening, you say, ‘It will be fair weather, for the sky is red.’ 3And in the morning, ‘It will be stormy today, for the sky is red and threatening.’ You know how to interpret the appearance of the sky, but you cannot interpret the signs of the times. 4An evil and adulterous generation asks for a sign, but no sign will be given to it except the sign of Jonah.” Then he left them and went away. 8And becoming aware of it, Jesus said, “You of little faith, why are you talking about having no bread? 9Do you still not perceive? Do you not remember the five loaves for the five thousand, and how many baskets you gathered? 10Or the seven loaves for the four thousand, and how many baskets you gathered? 11How could you fail to perceive that I was not speaking about bread? Beware of the yeast of the Pharisees and Sadducees!” 12Then they understood that he had not told them to beware of the yeast of bread, but of the teaching of the Pharisees and Sadducees. 17And Jesus answered him, “Blessed are you, Simon son of Jonah! For flesh and blood has not revealed this to you, but my Father in heaven. 18And I tell you, you are Peter, and on this rock I will build my church, and the gates of Hades will not prevail against it. 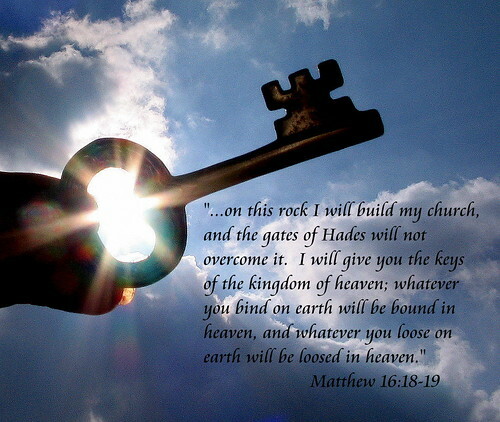 19I will give you the keys of the kingdom of heaven, and whatever you bind on earth will be bound in heaven, and whatever you loose on earth will be loosed in heaven.” 20Then he sternly ordered the disciples not to tell anyone that he was the Messiah. "Take up your cross, and follow Me." “I have decided to follow Jesus” sung by Espirit de Corps, a high school music and drama team from Lincoln Berean Church in Lincoln, NE. "They are blind guides," Matthew 15:14, Annie Vallottin. 29After Jesus had left that place, he passed along the Sea of Galilee, and he went up the mountain, where he sat down. 30Great crowds came to him, bringing with them the lame, the maimed, the blind, the mute, and many others. They put them at his feet, and he cured them, 31so that the crowd was amazed when they saw the mute speaking, the maimed whole, the lame walking, and the blind seeing. And they praised the God of Israel. –Jean Vanier, Drawn into the Mystery of Jesus through the Gospel of John. What miracle(s) have you seen? How, then, have you grown in love? "Jesus Multiplies the Loaves" from Vie de Jesus, MAFA. 35Then ordering the crowd to sit down on the ground, 36he took the seven loaves and the fish; and after giving thanks he broke them and gave them to the disciples, and the disciples gave them to the crowds. 37And all of them ate and were filled; and they took up the broken pieces left over, seven baskets full. 38Those who had eaten were four thousand men, besides women and children. 39After sending away the crowds, he got into the boat and went to the region of Magadan. The Ichthys, or fish symbol, was used by early Christians to identify themselves as followers of Jesus Christ. Ichthys is the Ancient Greek word for "fish." The word also forms the acronym "Jesus Christ, God's Son, Savior." 3For Herod had arrested John, bound him, and put him in prison on account of Herodias, his brother Philip’s wife, 4because John had been telling him, “It is not lawful for you to have her.” 5Though Herod wanted to put him to death, he feared the crowd, because they regarded him as a prophet. 6But when Herod’s birthday came, the daughter of Herodias danced before the company, and she pleased Herod 7so much that he promised on oath to grant her whatever she might ask. 8Prompted by her mother, she said, “Give me the head of John the Baptist here on a platter.” 9The king was grieved, yet out of regard for his oaths and for the guests, he commanded it to be given; 10he sent and had John beheaded in the prison. 11The head was brought on a platter and given to the girl, who brought it to her mother. 12His disciples came and took the body and buried it; then they went and told Jesus. 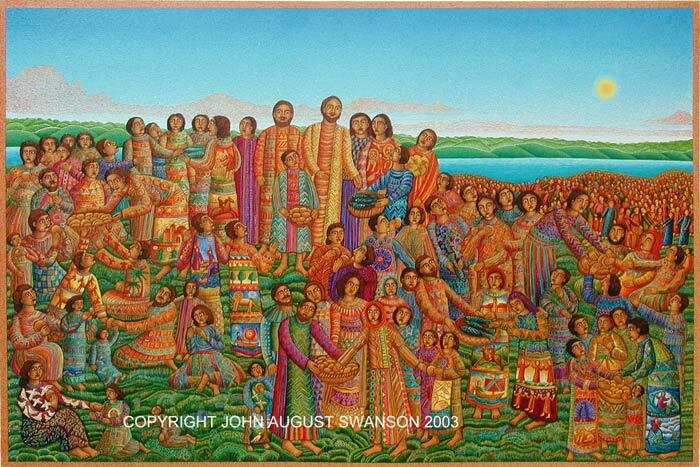 "Loaves and Fishes" by John August Swanson, 2003. 13Now when Jesus heard this, he withdrew from there in a boat to a deserted place by himself. But when the crowds heard it, they followed him on foot from the towns. 14When he went ashore, he saw a great crowd; and he had compassion for them and cured their sick. 18And he said, “Bring them here to me.” 19Then he ordered the crowds to sit down on the grass. Taking the five loaves and the two fish, he looked up to heaven, and blessed and broke the loaves, and gave them to the disciples, and the disciples gave them to the crowds. 20And all ate and were filled; and they took up what was left over of the broken pieces, twelve baskets full. 21And those who ate were about five thousand men, besides women and children. “I Am the Bread of Life” sung by John Michael Talbot. First, as you come to the table know that Jesus takes whatever you bring. He takes our bread, our wine, our gifts, our talents, our sins, our failures, our guilt, our shame, our weakness, our thirst, our hunger, our “not enoughs” – whatever we are. When you sit at this table Jesus takes you just as you are. Third, Jesus breaks what we bring him. Often we come to the table with our church smiles, best manners and all the right motions. At this table we come naked, exposed and vulnerable before our God who sees through all our masks and our attempts to be self-sufficient. Here we are taken into the crucifixion. We enact this by out eating the bread and drinking the cup, but what it means is as we are being broken we are being opened to new life and new action. We exchange ourselves for the life Christ offers. Fourth and finally Jesus gives back to us what we bring to him but it is no longer what we brought. Who we are, this person that we offer to God at this table, is changed into something else that God gives, something transformed by what we sing of as Amazing Grace. The gift returned to us is not to be hoarded but shared – and it is always enough. Yes, Jesus takes you and me just as we are but he never leaves us just as we were. 22Immediately he made the disciples get into the boat and go on ahead to the other side, while he dismissed the crowds. 23And after he had dismissed the crowds, he went up the mountain by himself to pray. When evening came, he was there alone, 24but by this time the boat, battered by the waves, was far from the land, for the wind was against them. 25And early in the morning he came walking toward them on the sea. 26But when the disciples saw him walking on the sea, they were terrified, saying, “It is a ghost!” And they cried out in fear. You are currently browsing the DWELLING in the Word blog archives for July, 2009.